Drawing on the authors’ background in education and policy development, Agricultural and Food Policy, Sixth Edition provides a comprehensive treatment of domestic and international policy setting, process, options and consequences. This book goes beyond the traditional discussion of farm programs, and gets readers thinking in broader terms, by considering the many forces—globalization, technology, food safety, environment—that influence policy change. 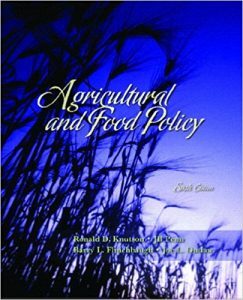 Taking an unbiased approach, this edition includes more economic theory, a new chapter on government involvement, current policy issues, and a chapter devoted to the future of agricultural and food policy. Informs readers of the most recent policy issues, such as the Doha Round of WTO negotiations, food terrorism, and budget deficits, in an objective manner. Creates an understanding of how U.S. policy affects stakeholders in other countries. Shows the importance of current WTO negotiations to policy outcomes. Gives readers a deeper understanding of the conditions leading to government involvement, the constraints on government involvement, the role of economists and the limits of economics. Explains concepts using graphs and helps readers understand the underlying theory driving policy decisions. Examines the impact of constituency groups and encourages readers to consider the future of agriculture and food policy. Those interested or involved in agricultural and food policy.